AWWWWE What a Cutie of a Card/ornament...your little Santa pooch is so adorable. Your Card idea is Brilliant.....You definitely showcased today's sneak peek in a most Creative way!! Oh my!!! It's totally adorable!!! Super cute! Would be a great tag or ornament. can then be used as an actual ornament. Adorable and fun! Your project is great! Your card ornament is adorable!!! That pup is too cute!!!! What a great idea to make your card look like an ornament. The face on that dog is just too cute! Adorable ornament shaped card with this cute puppy. Great idea for a circle card! 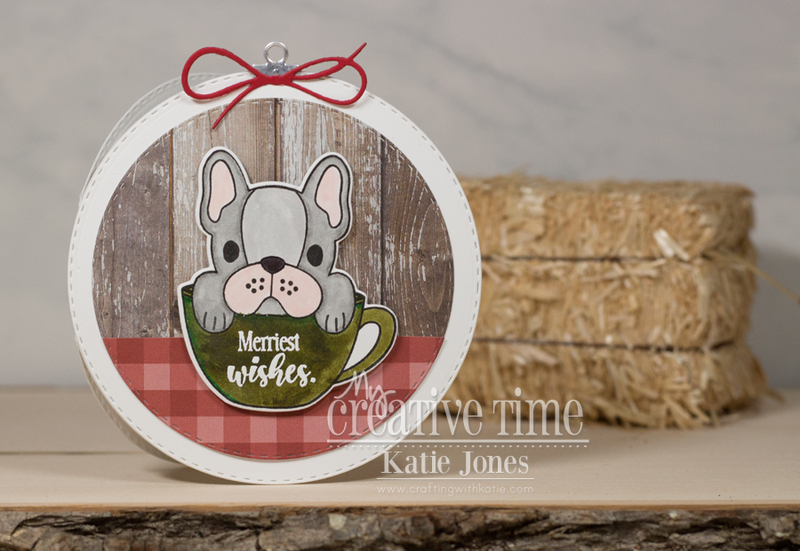 The little French Bully is adorable and I like the pattern papers you used to make your scene! Great idea. When I looked at this, it made me smile. The doggie is just adorable! Love it! Sweet project. Thanks for sharing!!! Love the circular card! And the puppy is sooo cute! Too cute,the circle shaped ornament card with the pup is such a clever idea. What a festive little ornament! That little pup is simply adorable!